Ahead of the expiration of its reserve of midazolam, one of the drugs used to carry out the death penalty in Arkansas, the state has planned seven executions in 10 days beginning next week. Don William Davis, Bruce Earl Ward, Stacey Eugene Johnson, Ledell Lee, Jack Harold Jones, Kenneth D. Williams and Marcel W. Williams are the men who are scheduled to be killed in this short period of time. Society in Arkansas will not be made safer by this course of action. As we mark the beginning of the Easter season on Monday, we will find ourselves culpable of ignoring Jesus’ example. He came so that we would love one another, protect each other from harm and work for the goodness of all. These are the acts of restorative justice. In turning toward mercy and away from violence, we are not asking for our society to be soft on crime, but we are asking our judicial system to cease exacting only retribution. 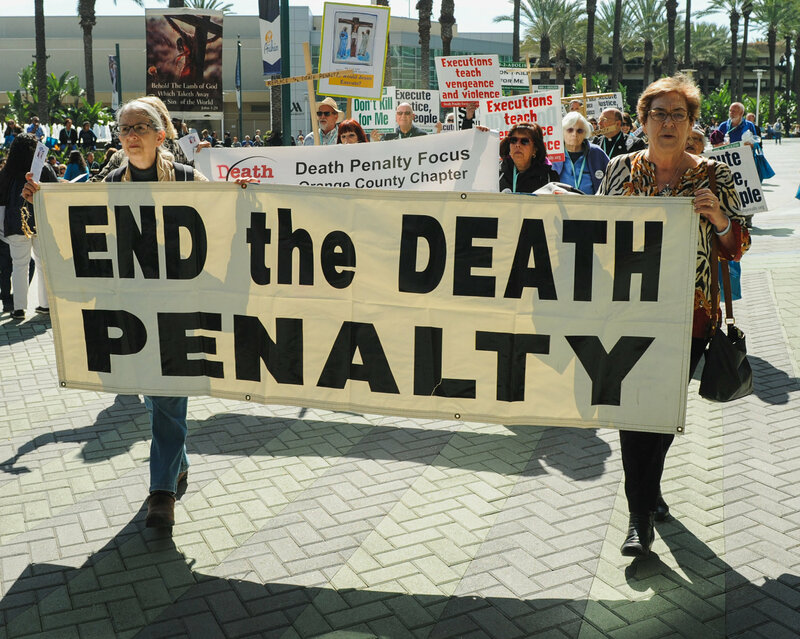 The death penalty is not restorative, nor does it recognize the dignity of all life. Why do we use violence to solve violence? Humans have turned on each other since the beginning of time, committing horrific crimes. Our natural response has been to kill those who kill. Why? Fear. Fear that we cannot be kept safe from those who have done great harm. But we have a substantial prison system in this country, and murder rates do not vary between states with the death penalty and those without. Execution is not a deterrent to violent crime. If execution does not reduce crime, does it relieve the suffering of victims’ family members? On the contrary, family members will commonly say that they are re-victimized by the death penalty. While they are promised peace, what they get are years to repeatedly relive the horrific events at each stage of the appeals process. When the execution finally takes place, another family—that of the executed perpetrator—must endure grief. And this new death certainly does not bring back the beloved victim. We respond to violence with violence in order to exact revenge. A revenge that stands directly opposed to the image of Jesus we will honor this Easter. In the Passion readings of this Holy Week, we are reminded of the 2,000-year-old drama of the legal, public and strategic execution of an innocent man. Jesus, who was subjected to a painful state-sanctioned execution, responded counterculturally and forgave those who crucified him. He went so far as to welcome the sinner who hung beside him into his kingdom in heaven. As a society we should expect justice and protect ourselves, but also follow Jesus’ example and seek to restore victims and perpetrators. Not exact revenge for its own sake. Through restoring all who have been affected by a grave harm, we can work toward becoming the peaceable kingdom of God, the Easter message of the Resurrection. The man that Jesus promises will be in Paradise did admit that the death penalty he received was just but that Jesus was wholly innocent. Ms. Clifton, can you please explain how "Restorative Justice" can be carried out in the case where wanton murder has taken place ? at least have the dignity to mention the victims and describe how and why they were murdered and how long these men have been on Death Row ? suffering what you inflicted upon your victim ? be addressed rather than just saying: "We ended the Death Penalty"
and wiping our hands as we walk away from the question of what becomes of the prisoners. What is "restorative justice"? It seems to mean that we restore a person to the environment where he can kill again. Forgiveness does not equal dispensation from consequences. I agree that general welfare is not justification for taking the life of a murderer. The justification for capital punishment of a murderer is its expressing society's high value of innocent life. Imprisonment of the murderer -- horrific as that may be -- does not have the desired expressive value. Perhaps America needs to publish more articles on restorative justice, given comments that indicate either ignorance of the concept or denial that it has any place in the judicial response to murder. And perhaps we would -- all of us -- do well to contemplate the irony of our claiming to have a correctional system when we actually have a punitive system which does far too little to assist its clientele to correct their minds, hearts and behavior. And I'm sure I'm not the only reader who learned just a few days ago of the 1919 extra-judicial killing in Arkansas of a black American army veteran of the 1918 WW 1 battles in France. The justice system is far from just. Even seeing its operation in the less-than-lethal divorce court shows the extreme fallibility of the system. Prosecutors who want to put notches on their whatevers, racial bias, poor representation due to poverty. This system is not good enough to go around killing people. Karen Clifton is executive director of the Catholic Mobilizing Network.